I'm meeting a friend in Elmhurst for lunch on Friday. Mention of this to my wife drew a series of specific instructions: I was to go to Victor Lezza's new retail store. I was to buy cookies—don't skimp on the lemon ricotta—cannoli, the shells separate from the filling, thank you, to preserve crispness. And finally, don't forget the spumoni. Which made me think of this story. I can't believe I haven't shared it with you up to now. One of my favorite opening ledes. I've spoken with Louie Lezza, and at some point—next week, surely, assuming the steady drumbeat of real news takes a rest, and Chief Keefe doesn't throw his hat into the ring for the mayor's race—I'll find a way to offer an update. Spumoni has been sufficiently covered, below. Time to blow the lid off the Italian cookie situation. In Italy, they know not of spumoni. "Spumoni? What is this? I have never heard of this," says Marianka Campisi, of Bologna, a 25-year-old intern at the Italian Cultural Institute of Chicago. "I don't think we have this in Italy." Rather, the distinctive type of ice cream was invented in America by newly arrived Italian immigrants. But we are getting ahead of the story, which begins not long ago in the frozen food aisle at Sunset Foods. "I'm getting spumoni," I told my wife, in that way husbands have of automatically narrating their actions, so as not to risk doing anything unapproved. I love spumoni and didn't expect resistance. But my wife regarded the container of Edy's spumoni in my hand as if it were a dead kitten. "Not that spumoni," she said. "I grew up in Bellwood. If you grew up in Bellwood, there is only Victor Lezza's." I returned the Edy's, and reached for a container of Lezza's which, I saw from the label, indeed comes from the west suburb. Which piqued my interest. They're making ice cream in Bellwood? Out front, Lezza Spumoni & Desserts looks like any small Italian bakery. A sign offers cakes for weddings and baptisms. Inside, glass cases display distinctive Italian cookies—amaretti, regina, quasimale—in the shapes of leaves, shells, hearts. I sit down with Ed Lezza, the third generation Lezza to make spumoni in Chicago. His grandfather, Salvatore Lezza, left his hometown outside Naples and came to the West Side in 1905, where he formed a partnership with the man who created Ferrara Pan candy, to this day a big local candy company, maker of Lemonheads. "They were in business, Ferrara and Lezza," says Lezza. "My grandfather was the baker, and Ferrara was the candy maker." Soon the partnership extended beyond business. "My grandmother's a Ferrara, Lucia Ferrara," he says. Despite my wife's belief that the company has been in Bellwood "forever," its first 60 years were in Little Italy. Then Lezza's got in the way of the University of Illinois. "We probably still would have been down at Halsted and Taylor streets, but Circle Campus came down there and condemned the property," say Ed Lezza. "We wanted to stay there and we were forced to move." Salvatore Lezza passed the company on to his two sons, Jack and Victor—Ed's father. "I pulled this out of the safe," says Ed Lezza. "It's something precious to us. I wanted to share it with you." Lezza displays a small notebook, filled with scrawled 75-year-old recipes, some jotted on the backs of Banco di Napoli Trust Company Bank deposit slips. "We keep exactly as my grandfather had written it," he says. "Everything the same." The bakery kitchen is charmingly old school—marble tabletops, a cedar-lined cooler. 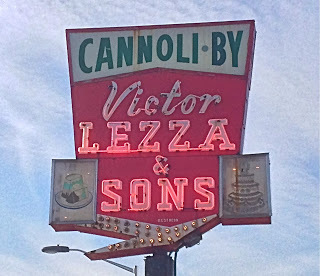 "You don't see them too much no more," says Louie Lezza, Ed's nephew and a fourth generation Lezza to make spumoni. The spumoni production area seems impossibly small for a facility meeting the spumoni needs of 700 local restaurants and 24 states. "We're pretty close to outgrowing this plant," says Ed Lezza. "It's just a matter of time until we move into a large facility." Strawberry and pistachio are being mixed in two huge stainless steel vats. The flavors are complex—the strawberry has pineapple in it, seven different types of chocolate go into their chocolate. "We use the European-style blending," says Ed Lezza. "The pistachio isn't just pistachio." The completed, complex flavors are chilled to 21 degrees. At that temperature, they flow smoothly into containers, but don't bleed into each other. The flavors don't freeze because of the butterfat. "It's like anti-freeze," says Louie Lezza. The four ice cream flavors go in first, and then the burst of whipped cream at the center, which demands a special serving style for spumoni. "Spumoni must be sliced," says Ed Lezza. "You slice it, you have all five characteristics in every slice." Feeding four cups at a time under a filling machine is a bearded worker wearing purple latex gloves. I'm surprised to find he's Ed's son, Ed Lezza Jr., 38. I suggest that it's unusual for an owner of a business to work the packing line. "It's in my heart," he says. "I want to make sure it's right. It's my baby." He is also national sales manager. Customers are sometimes surprised when he delivers shipments of spumoni. "We do everything," Ed Lezza Jr. says. "It's a service-oriented business." Speaking of service, he is also a Bellwood village trustee. I ask: how's Bellwood doing? "We're holding our own," he says. "We're having our own new Metra station coming to Bellwood with 900 parking spots." And indeed, the neighborhood around Lezza's, including my wife's old house at Park and Frederick, looks well-tended and inviting. Driving north on Mannheim Road, snaking my hand into the big white cardboard box of Lezza's cookies sitting on the seat next to me, the future brightens. 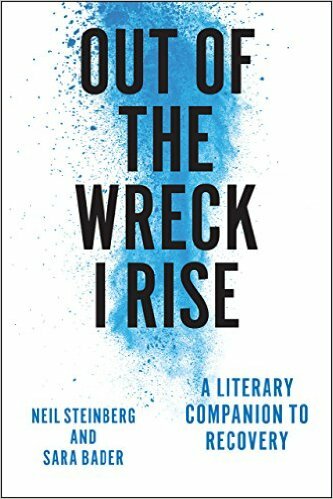 Things change and institutions crumble, so we need to pause, now and then, to appreciate what has not changed, the good things that are still with us. Wow, never heard of them before, now can't way to go there. My stomach and I thank you. Next time you go to New Orleans, make sure to visit Angelo Brocato's for similar character and fare. Reading this again reminds me of how much I like spumoni; Lezza’s is a bit far, but a trip to Sunset may be in order. 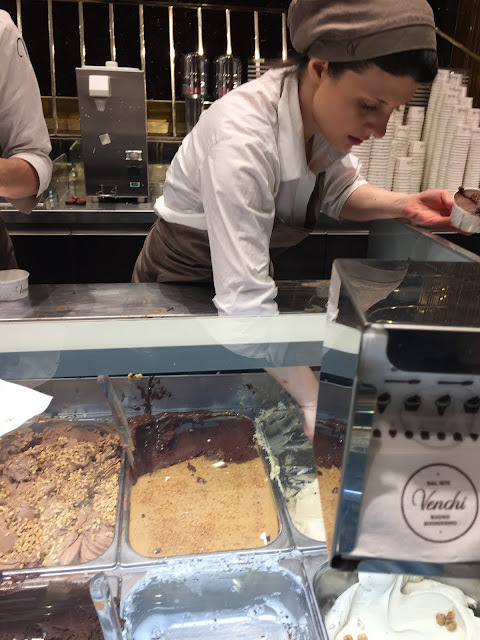 That spumoni is a Yankee invention is something of a revelation, but memories of nighttime strolls in such gelato heavens as the piazza's of Rome and Florence do not surface any such concoction on offer. Not that it was missed in such venues. I worked at Lezza's back in 1982. I used to love making cannoli shells and working up front filling the cannoli's and running the register. It was only a 200 ft. walk to work!! Great family. Happened to be in Elmhurst yesterday and made a stop at Lezza's. I'm not much of a spumoni fan, but the gelato was delicious! Took home a tasty slice of German chocolate cake. I want my Maypo; I hope I'm not alone in that.